If you had asked me if I knew what sunbutter was just a few years ago, I would have had no idea what you were talking about. I certainly wouldn’t have known how to make my own! However, after realizing that one of my kids is allergic to nuts we dived into the nut-free world and were introduced to sunbutter. Sunbutter is great. It tastes almost like peanut butter, so much so that even I don’t mind using it. 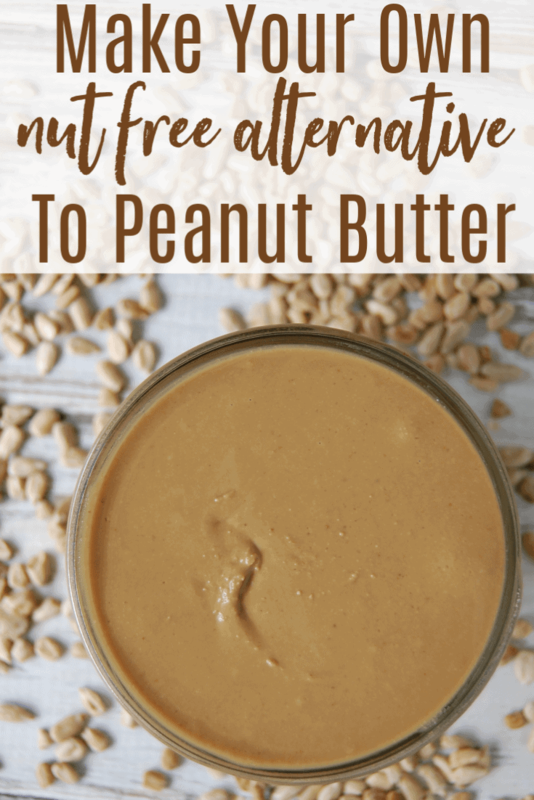 Having this nut free alternative means I can allow my son to enjoy some of the funner things in life like sunbutter cups, sunbutter smoothies, sunbutter sesame noodles, and of course the good old SB&J. However, I’m not a fan of store bought sunbutter. Don’t get me wrong, their ingredients are good and it’s made well but I have a few reasons why I prefer homemade sunbutter. I really have no idea why the taste is different with homemade but homemade sunbutter tastes SO much better than store bought. When you make your own sunbutter, you can customize it to your taste preferences and desires. Do you like things sweet or do you prefer unsweetened? Do you like sunbutter with a bit of spice like cinnamon? Or perhaps you are dying for a nut free version of Nutella? With homemade sunbutter you can do it all! Homemade sunbutter is much cheaper than store bought. The last time I did the math, homemade was about half the price of store bought! Even if I were to buy sunbutter at Costco, homemade still comes out cheaper. So without further ado, here’s how you can make this wonderful stuff! Preheat oven to 350 degrees. Arrange sunflower seeds on a baking sheet and roast in the oven for about 5-10 minutes. Make sure to check on them often so that they do not burn. Once seeds have been roasted, allow to cool. Place seeds into a food processor (I’ve heard high speed blenders work too) and turn the food processor on. The process will take 5-10 minutes and you may need to stop the machine and scrape down the sides occasionally. Keep processing until things are smooth. Once you have a smooth consistency, add in the oil, salt, and sweetener. Turn food processor on for a bit longer to fully incorporate and then you are finished. Place in a jar and store in the refrigerator. 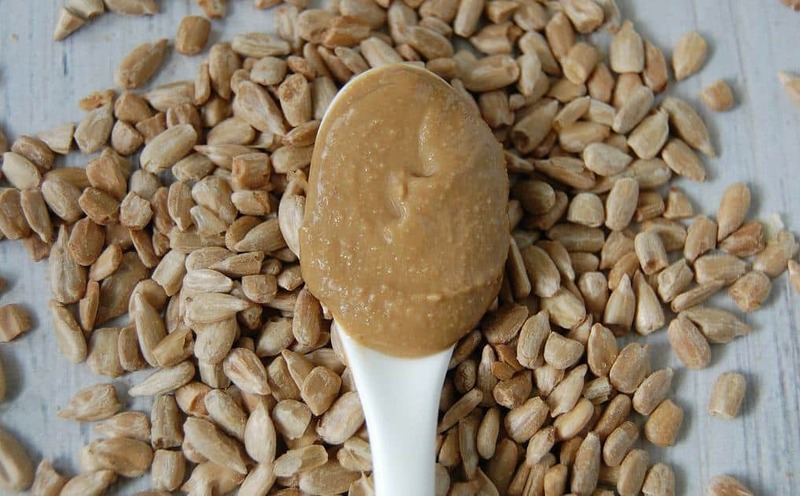 You can use already roasted sunflower seeds but those tend to have less oils in them and thus results in a drier sunbutter. If you would prefer you can use another light tasting oil. I prefer coconut oil for its health benefits but coconut oil does solidify when cold so the sunbutter will firm up in the fridge (to about fudge consistency). You can customize this sunbutter in so many ways. Add cinnamon, cocoa powder, vanilla, maple, even orange. Get creative! * 1/32 tsp of stevia is the equivalent to 1 tiny stevia scoop or a “smidgen” measuring spoon. Hi! I'm allergic to most nuts too. Can I ask where you buy your sunflower seeds? I generally just buy Bob's Red Mill sunflower seeds (usually through vitacost or amazon). Unfortunately finding sunflower seeds that are processed in a nut free facility is actually really hard… Bob's Red Mill is not a nut free facility if I remember right but thankfully my son is not allergic to nuts to that extreme. Yum! 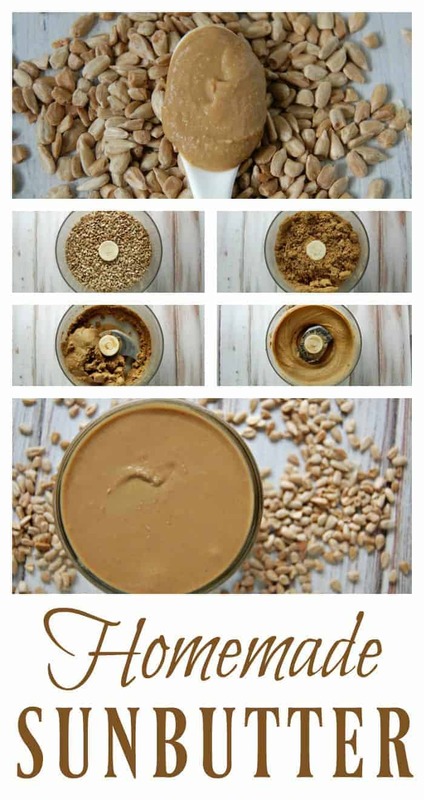 I love to make my own nut butters so this recipe for sunbutter recipe is on my list to make next! I’m pinning and sharing this! This looks amazing! I’ve never had sunbutter, but I think I’ll have to try it after seeing this. Yum! Should I assume that for your sunbutter recipe, the sunflower seeds have been soaked to avoid phytates? Just learning about all this…thanks! Great question. Yes, ideally the seeds should have been soaked and dried prior to the roasting and blending. However, it is also possible to use un-soaked seeds, they will just have more phytic acid.